OEKO-TEX® announces that its ECO PASSPORT certification has been recognized as a LEVEL 3 ZDHC MRSL Conformance Indicator for the ZDHC Roadmap To Zero Programme. The ZDHC organization’s Manufacturing Restricted Substances List (ZDHC MRSL) is implemented in connection with the ZDHC Gateway– Chemical Module. ZDHC MRSL Conformance LEVEL 3– the highest level in the current program– indicates that ECO PASSPORT certified chemical substances meet the ZDHC’s guidelines for safer textile chemistries that are also verified as being responsibly manufactured. The ZDHC’s MRSL covers chemical substances that are limited or banned from intentional use in the production of apparel and footwear materials and trim in order to protect workers, consumers, and the environment. 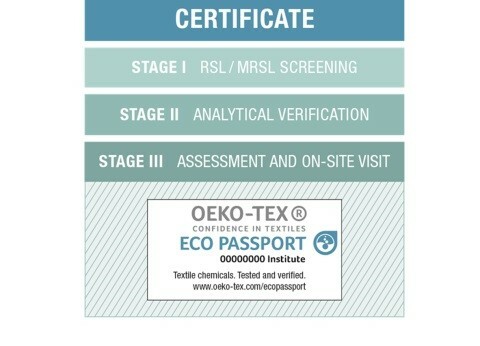 The ECO PASSPORT by OEKO-TEX® program analyzes a broad set of chemicals including colorants, scouring agents, adhesives, inks, pigments, and auxiliaries in a confidential, three-step process that confirms that the formulations and individual ingredients (CAS level chemicals) meet specific criteria for sustainability, safety, and regulatory compliance. Chemical formulations are checked against the comprehensive OEKO-TEX® list of substances of concern and then verified by laboratory evaluation to ensure that they do not contain unsafe contaminants. Sustainable production is verified with on-site-visits of the manufacturer’s occupational safety methods, water and air protection mechanisms, and quality control practices in line with STeP by OEKO-TEX® guidelines for sustainable production facilities. Formulations that are ECO PASSPORT certified are eligible to be listed on the ZDHC Gateway – Chemical Module and the OEKO-TEX® Buying Guide so that they are easily identified by apparel and footwear manufacturers shopping for sustainable chemistries.